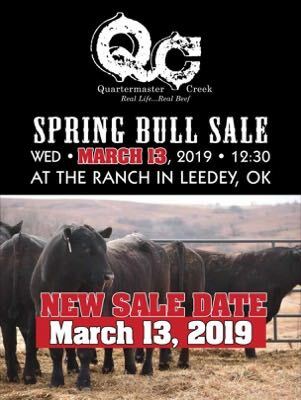 Due to inclement weather, Quartermaster Creek sale is postponed until March 13. 'Bred to be Tough' and Developed to Last! Bulls selling have been parent-verified and have genomically-enhanced EPDs using the i50K test. 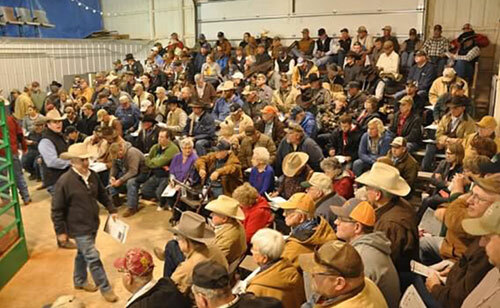 Our sale bulls are handled exactly the same for the past several years. They were raised on cows without creep until weaning, then on wheat pasture though graze-out, then on grass through the summer and early fall. The bulls were fed growing ration for approximately 100 days, then fed grass, hay, and cubes on the ground. The bulls will be presented in a manner that our customers can see their individual differences along with a few blemishes. We believe this method delivers a two-year-old bull ready for heavy service that will hold up in the harshest of conditions.